What are the ethical implications of the semantic web, biometrics, radio-frequency identification, location-based services, mesh and ubiquitous networking, grid computing and other new computing technologies? A study just released by UNESCO analyses likely consequences of different technological choices. 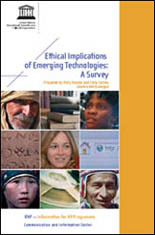 The survey entitled "Ethical Implications of Emerging Technologies" has been prepared by Mary Rundle and Chris Conley of the NGO Geneva Net Dialogue at UNESCO's request. In presenting results of this examination, the report first tells an introductory story of how the technologies covered relate to one another. Next, infoethics goals are presented. Then, for each technological trend surveyed, the report contains a short chapter drafted in lay terms to provide an overview of the relevant technology and to highlight ramifications and concerns. The report then summarizes this infoethics analysis and revisits the story of the emerging technologies. Finally, the report offers recommendations on ways to advance infoethics goals in anticipation of these oncoming technologies. Bibliographic reference: UNESCO. Information for All Programme (IFAP). "Ethical Implications of Emerging Technologies: A Survey". Edited by the Information Society Division, Communication and Information Sector – Paris: UNESCO, 2007 - 92 p ; 21 cm.